ON NOVEMBER 14, 2013, the DoPT issued a notification mentioning the name of a 1994 batch IAS officer whose unauthorized overstay in Uttarakhand seven years ago, has been regularized. 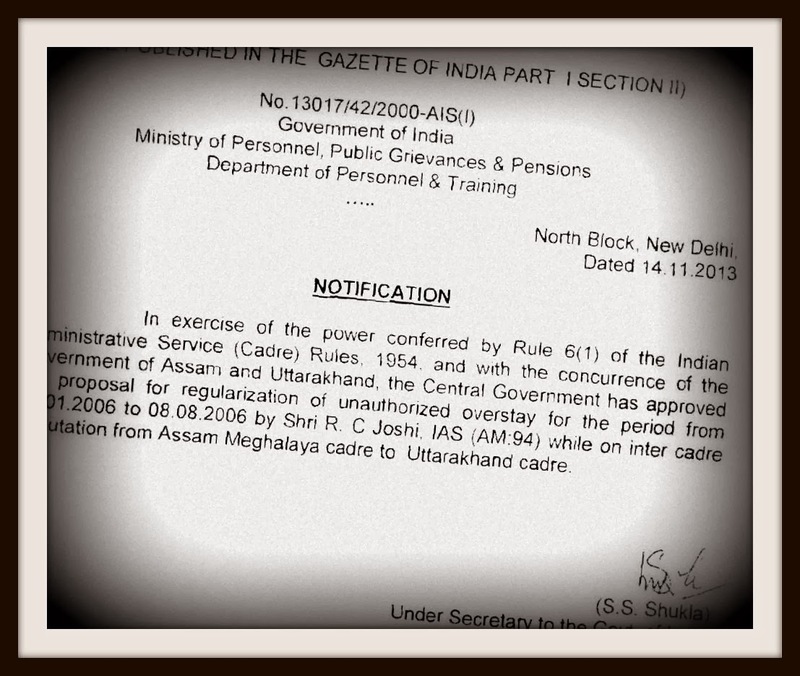 The notification signed by under secretary SS Shukla and sent to four officials viz. Originally hailing from Uttar Pradesh, Joshi is an engineer-turned IAS who started his career as an SDO in Meghalaya and became a deputy commissioner in South Garo Hills. 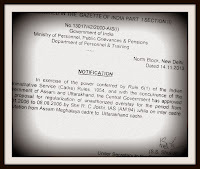 According to Executive Record Sheet of the officer, he has been a secretary in the finance department of Assam Administrative Staff College since January 2010. We have received two messages saying there is nothing unusual about regularization of unauthorized extension of deputation tenure. So what's the big deal? But the question is, DoPT's repeated stricture asking officers to take prior permission before overstaying in a posting gets violated on a regular basis. Also, even if "unauthorized" overstay is regularized, why should the government take seven years to do the same? What message does it give to the government's time-bound delivery mechanism? Maybe, it's the time to change the attitude.